The general counsel of the Agriculture Labor Relations Board went to court in April to impose a union contract on Gerawan Farming employees, without proper input from the farm workers, and without counting the ballots of a United Farm Workers union decertification election, held in November 2013. And now, an attorney with the ALRB has filed a discrimination and harassment lawsuit against ALRB General Counsel Sylvia Torres-Guillen, and ALRB attorney Alegria de la Cruz. The Plaintiff is Francisco T. Aceron, Jr.
Aceron has been employed with the ALRB since year 2000 as Legal Counsel. By 2003 Aceron was promoted to Assistant General Counsel ll, a position he held for more than 11 years, the complaint says. But by 2011, that all began to change when Gov. Jerry Brown appointed Torren-Guillen General Counsel. “By late 2011, many of Plaintiff s older colleagues had been forced out of their long term positions at the ALRB, and replaced by new attorneys with 5 or less years of legal experience, all under the age of 40,” the complaint alleges. 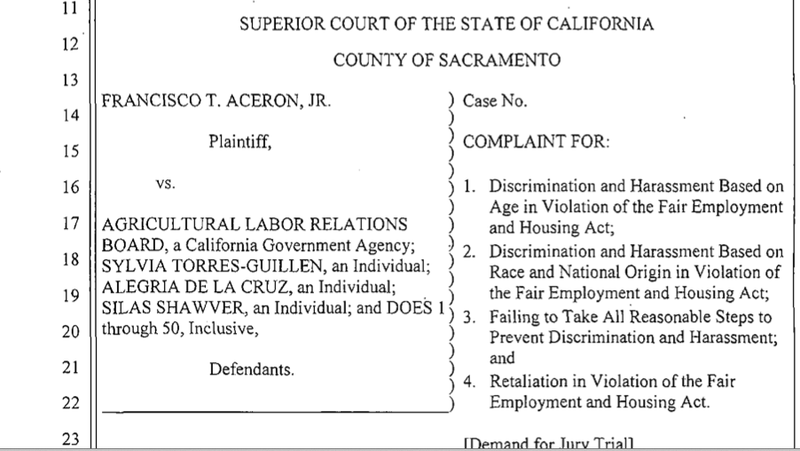 Aceron’s lawsuit identifies many ALRB legal employees who were allegedly forced out of the agency by Torres-Guillen and De La Cruz. This isn’t the first legal snafu for the ALRB. The ALRB, Torres-Guillen, and Alegria De La Cruz have a history of abusive overreach in the case of the Gerawan Farming workers, clearly demonstrating growing desperation in the trending anti-union sentiment in the private sector, and the vast agriculture industry of California. Torres-Guillen is a former federal Public Defender, known for representing a mistress of former Orange County Sheriff Mike Carona. Alegria De La Cruz previously worked for the Center on Race, Poverty and the Environment as a staff attorney. Prior to the center, De La Cruz worked for the California Rural Legal Assistance Foundation as a staff attorney. The California Legislature is responsible for authority and oversight of this state board. But there has been no oversight from the Legislature since Torres- Guillén was appointed by Gov. Jerry Brown in 2012, despite numerous appeals from the thousands of Gerawan farmworkers to the governor, and the Latino Caucus. In October 2012, the United Farm Workers Union insisted that a collective bargaining agreement covering Gerawan workers be reactivated — even though there had been no union involvement with the workers since prior to 1995. Some of the workers then began a process for a vote to decertify the union. Many in the farming community claim the ALRB and UFW have joined forces to boost the union by targeting one of the biggest non-union farming operations in the state. Gerawan Farming filed the lawsuit with the California Court of Appeal, Fifth District in Fresno, challenging the ALRB’s invocation of the California’s Mandatory Mediation and Conciliation Statute. The mandatory mediation statute was signed into law by Gov. Gray Davis in 2002. Most recently, Arcelia Hurtado was brought in to the ALRB to spearhead the apparent Gerawan Farming takedown. Based on this bio, why would Hurtado actively fight against the farmworkers who are trying to decertify the UFW labor union, and ignore their legal and civil rights? It is telling that the ALRB brought in a high-powered, evidently highly compensated, Hispanic civil rights attorney. The UFW has never formally represented Gerawan farm workers because the union allegedly failed to contact the company for two decades after workers 20 years ago voted for union representation. Officials with the ALRB say the issue is not as simple as their alleged refusal to count ballots. “Arcelia Hurtado, an attorney for the ALRB, said the board is currently investigating allegations that Gerawan Farms broke the law by instigating last year’s decertification vote,” ABC 30 reported in August. Hurtado says other allegations are currently being investigated by the ALRB as well. “We are investigating irregularities in the vote,” Hurtado said. The farmworkers are protesting because last November they took a vote to decertify their contract with the UFW. The ballots were handed off to the ALRB, which has yet to count them. The ALRB’s state-sponsored union bullying effort continues even after longtime Gerawan Farming employee, Silvia Lopez, filed a federal civil rights lawsuit against ALRB board members and top staff, for their refusal to count the ballots from the November 2013 election. Many in the farming community claim the ALRB and UFW have joined forces to boost the union by targeting one of the biggest non-union farming operations in the state. Should they succeed in unionizing Gerawan Farming employees, adding the 5,000 farmworkers would double union membership, and certainly boost the ALRB’s status. The abusive overreach by the ALRB and its general counsel shows growing desperation in the trending anti-union sentiment in the private sector, and the vast agriculture industry of California. However, if the ALRB loses, or makes procedural errors, because it is a state agency, Hurtado, Torres- Guillén, and De La Crus will pay no price. Who will hold these women accountable? This entry was posted on Wednesday, October 15th, 2014 at 10:13 pm and is filed under Blog Posts.